Whenever you are starting an enterprise, be it a musical label or not, you want your first production to be a memorable one, a source of pride which sets the sail off for the whole franchise. Artistic black metal label Northern Silence is trying to branch out more into the gothic territory with the subprint Beneath Grey Skies, and Soror Dolorosa Blind Scenes is BGS first actual release (after a couple of license re-issues). Soror Dolorosa came to BGS through a recommendation of Neige (Amesoeurs, Alcest), has ties to French metal underground, and it is gothic alright, but first impression of the album was for it to be a monotonous mess. Pretty miraculously, even during the second run through, the pieces of the puzzle fell in place coherently and I have begun to enjoy this truly drab-colored winner of an album immensely. Built on the foundation of potent bass, persistent percussion (repetitive, but not harsh or techno-like) and jangly, not always clearly audible guitars, Soror Dolorosa (Sister Pain in Latin) created a perfect music for a gloomy rainy day. In no time you will find the album’s repetitiveness inviting, your head will be bobbing, mood floating, drawn into the proverbial vortex with these, dare I say it, danceable songs. Add in aloof, blank stare, a bit androgynous vocals and you can’t get any more Gothic Rock than this. Not symphonic with a good-looking female front, as it is so popular these days, but the one harkening back to the days of early Depeche Mode, The Cure and Sisters of Mercy. Taking on a bit more urgent guitar tone, the band can deliver a hit with Autumn Wounds, which should have all fans of Discouraged Ones by Katatonia crawling from their basements. Damaged Dreamer pushes boundaries, and you begin to wonder whether there is hysteria hiding underneath the withdrawn, I-simply-do-not-care façade. Low End is more reserved, echoing and resonating, claustrophobia setting in, but every track on this album, while having a lot in common with its predecessor or successor, has an ability to surprise, stand alone or as a part of the whole. 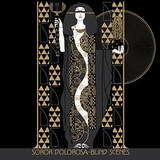 Soror Dolorosa, the song, is a downtrodden hymn with smooth guitar and another strong bass display. Scars of Crusade provide some relief but remain plenty grey, In a Glance is probably the most up tempo, before the closer Broken Wings manages to pour on incredible sadness shoulders tall. Blind Scenes is an album you will absolutely have to have if your wardrobe contains chained black clothes and thick-platform shoes, or if you wore some dark makeup at some point in your life. If you don’t possess any of those items, don’t despair, put Blind Scenes on and they will teach you the meaning of the highlighted term while rocking you all the way.